You can post your best times...and repost if you beat them. no chatting here... start another thread if you wanna discuss with others. she got 13.612 @ 105.803..
Must run 14.128 or faster to get onto the Top 10 list. Next Top 10 will be posted July 3rd from entries submitted by July 2nd. My best time was last year. I ran at Race City. This year i should be much faster once i get the thing tuned. 12.8 @ 104mph 1.8 second 60ft. what kind of set up do you have? that's pretty quick! 14.3@98mph at Mission Raceway Park. 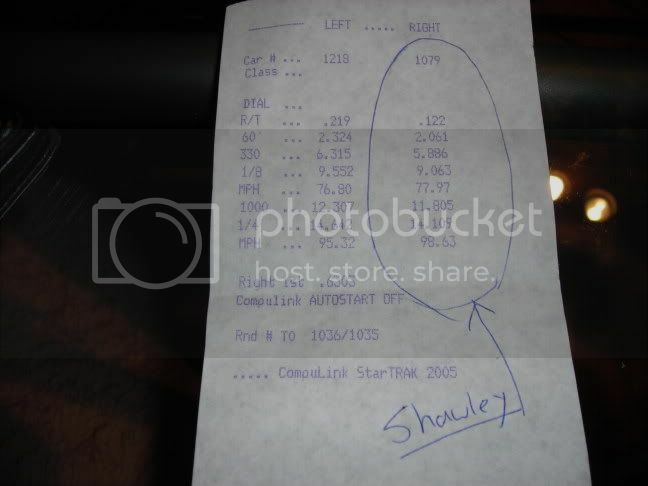 15.06 @ 95mph last night, wanted a 14.9, but couldn't get it. This was at race city, and the conditions weren't exactly ideal either. Oh and my car only has a custom catback.